The Hook: Brian May says their breakthrough hit may not have rocked all that hard, but, boy, was it put together well. Stats: Peaked at number-12 on the Billboard Hot 100 and at number-two on the British charts. Background: When Queen released their third album, Sheer Heart Attack, in 1974, they’d had one Top 10 hit in Britain, and no hits at all in the U.S. 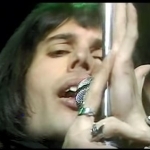 The song “Killer Queen” was the first to break big in both countries, which guitarist Brian May recalls having mixed feelings about at the time. Brian May on what he thought when “Killer Queen” became the song that broke the band in America.